It's kind of tricky to get a black bag to look like something other than a dark blob on the page! I was just going to have the linework and not fill it in — so you could see all the stitching — but went for it with the black. 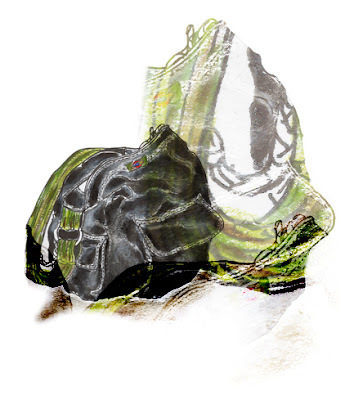 The inside of the bag is olive green camouflage, but I didn't feel like painting it, so I ended up adding the texture and color by repeating the bag artwork on top and underneath digitally.